We were invited by our neighbours for a galette des rois. Liliane and Alain had bought two types – one with almond filling (frangipane) and one with apple filling just in case we didn’t like frangipane. I took along some Christmas crackers (or bonbons as we call them in Australia) which, surprisingly, I had found at Truffaut, the local gardening store, so we ended up with two sets of crowns! Françoise, being the youngest, should have gone under the table, but we let her close her eyes instead and indicate who should have which piece – not that Alain took any notice of her. He just went ahead and served according to the size of the piece! Jean Michel got the first fève and crowned Liliane who then got the second one. 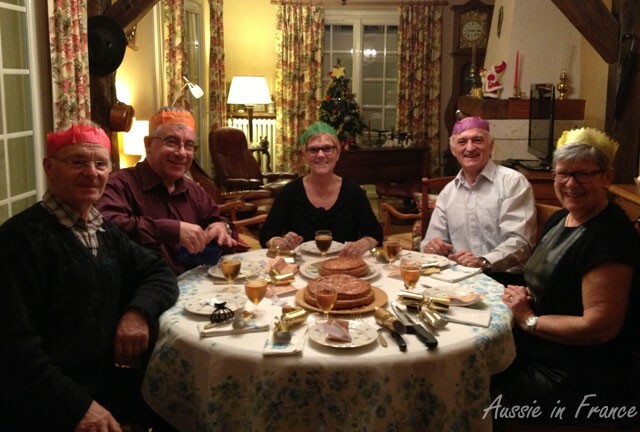 This entry was posted in Food, French customs and tagged Christmas crackers, galette des rois. Bookmark the permalink.